If you’re taking running seriously, pace is pretty important to you. The pace you train relates closely to the pace at which you race. Get your pacing right, and you’ll get that PB. Simple. Except it’s not usually simple because you need to measure two key variables in order to measure your pace: time and distance. Nike+ An entry-level pace solution that links through an iPod or a Nike Sportsband. I’ve not used Nike+ so can’t comment on how well it works (if you have, why not leave your thoughts in the comments on this post to help give a more balanced perspective). However, I’ve my reservations about its accuracy based on the fact that I know my stride length changes depending on hills, how tired I am, etc. Garmin A range of sports pacing products are available from Garmin, including some footpod-based (like Nike+, but without the music) and some more expensive items using GPS to measure pace. I have recently invested in a Forerunner 405CX. I’d read a number of reviews before deciding to buy this model, but none were really comprehensive or detailed. I felt that it would have made my decision easier to have a more detailed review. So, this is the first in a series of posts as I get used to the gadget, following which I’ll post a full product review. Hopefully this should help anyone else eying up whether to take the plunge. So, I’ve taken the Garmin for two runs so far. The first run was my long, slow run for the week (21 miles). Unfortunately, I’d charged the gadget to full about 9 days previously, which meant it ran out of battery at mile 8. Like anything else with GPS and various sensors, the Garmin is battery hungry. Although it charges relatively quickly, it’s something to be kept in mind if you’re planning to take it out on regular jaunts. Today I worked out how to use the Virtual Partner tool. The Virtual Partner is essentially the split time you want to make, so today I set a split time of 6:55 per mile for my 7-mile run. The watch gives you a display telling you how far ahead or behind the Virtual Partner (i.e. your target pace) you are. It also bleeps distinctively as you pass distance markers, which helps keep track of how far you’ve come. All very helpful. If I had any gripes so far, it’s the system for using the watch. You’ll read a lot about the ‘innovative touch bezel’ from Garmin, but what they won’t tell you is that it takes some time to get used to. It has four ‘hot spots’, which you touch to access different features of the watch. You select items in the menus by tapping the bezel. You light up the watch by touching the bezel with two fingers. You move round the menus by sliding your finger around the bezel. The problem is that the watch doesn’t easily distinguish between some of the different interactions, so setting the pace of the virtual partner (or the time, your weight, the level of exercise, etc.) becomes a bit of a test of patience. 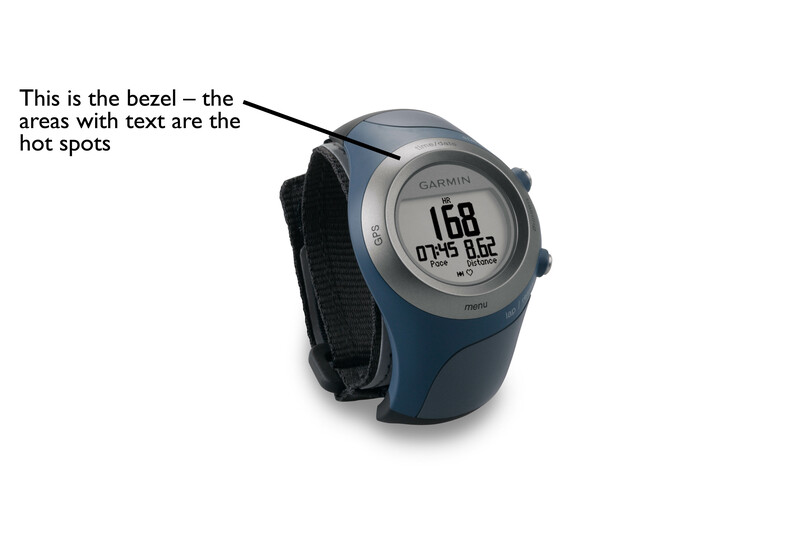 I suspect Garmin were trying to ape Apple’s wildly successful iPod click-wheel. However, like any other tech company that’s not Apple, but trying to have its iPod moment, it’s made something that’s not quite as functional as it should be. However, we’ll see here how long it takes me to get used to it. By the way, if you’re interested in pacing, you might also be interested in this post. It’s a less high-tech guide to getting your race pace on track, focusing on the trusty 10k. Greetings again Lewis. Fortunately its not as hot here as when I last posted a comment, so training has been a bit easier. I’m enjoying your blog and have to say you must be running quite well. I’ve had a Garmin for 3 months or so to help with my training. You can set the sensitivity of the bezel but I found I got used to it fairly quickly. I download my runs via Garmin Connect which produces Google maps of the route you took, time and elevation graphs, heart rate readings (if you use the HRM), details of your splits (I have an auto lap each km although the link when you see it as below in the public domain is all in Imperial – miles etc). Below is a link to yesterday afternoon’s run which shows the magnificent surrounds we have to run in here in Melbourne (in and around the Botanical Gardens) right near the city heart, and adjacent to the major sports stadiums including the MCG and the tennis Centre were they are holding the Aust Open currrently. Most of my weekend runs are in Brimbank Park. If you do a search on that in Garmin Connect most of the recent runs there are mine. They held the selection trials for the Australian team to run at the World Cross Country Championships (to be held in Poland late March) there on Sunday morning so I went down to see how the big names do it. Motivated me a bit this week! Wow, that looks like an amazing place to run. Glad the weather’s a bit more manageable. I’ve started playing around with the Garmin Connect site, and it looks pretty impressive. It’s great to be able to see your splits in quite a bit of detail, the terrain and where you’ve run. I usually use MapMyRun to plot my routes so I can keep tabs on distance. However, I’m planning to run Shotover Hill on Saturday, which has a tight network of paths that aren’t registered on the site, so the Google maps link from the Garmin should really help keep track of the distance I clock. Training for April is coming along well. I’m due to be up to marathon distance in the next month or so (at some point in February), which will be a huge psychological boost when I get to the start line. 26.2 miles still feels like an awful long way though! Lewis – have you ever yet missed a PB because you stopped to fiddle with your Garmin to make sure you were beating your PB? D.
Incidentally, provided you’re going into a left-hand turn, there might even be gravitational advantages to fiddling with a watch.